"The Potter's Wheel" is an beautiful, original, piano composition by Cynthia VanLandingham. It is about the unfolding mystery of life, where there is always so much more to learn... and appreciating this truth for greater awareness and conscious living! "The Potters Wheel," is a beautiful piano composition by Cynthia VanLandingham. 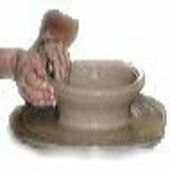 The Potter's Wheel is about the unfolding mystery of life, where there is always so much more to learn... And appreciating this truth for greater awareness and conscious living! Visit Cynthia's website for more beautiful music and a wealth of information about piano lessons.